James Bond’s investigation of a missing colleague in Jamaica leads him to the island of the mysterious Dr. No and a scheme to end the US space program. Right around the time I graduated high school I went down to Tower Records and Video near Soho, Manhattan and bought every Bond film to date up to Diamonds are Forever on Videocassette. When I got home I popped in “Dr. No” first and that was the beginning of a fruitful and long relationship with Sean Connery as the baddest spy to have ever walked this planet. “Dr. No” was amazing, but I was left wondering how they made “Moonraker.” Dr. No was produced by Cubby Broccoli and Harry Saltzman back in the early 1960s and it was after they saw Connery in “Darby O’Gill and the Little People” that they knew they had someone who could pull off their version of the hard- nosed, all business agent. But Connery brought more to the table than that. He had danger and threat lurking just behind those studly Scottish lips. Swiss actress Ursula Andress, who was cast after being seen in a photograph just two weeks before shooting began, is my very first Bond girl. Who will ever live up to that walking out of the water onto the beach scene? NO ONE! And She can act, too! I must, in all honestly, say that Joseph Wiseman out-acts just about everyone in this film as the evil megalomaniac Dr. No who is involved in appropriate evil Cold War hi-jinks with that grand-poobah of evil global organizations S.P.E.C.T.R.E. Craig is intense and so was Dalton who unfortunately made only 2 Bond pictures. Thanks for reading, man! one of my favorite Bond films of all time I know the video cassette is around here somewhere! Great write up Vic! Goldfinger is my favorite Connery Bond for sure. Thanks for reading! 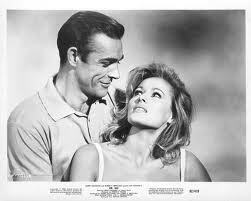 The old Bond films were the best! I collect movie poster postcards – postcards with the original movie poster reproductions on them – and recently finished my 60’s – 70’s bond collection. I’d like to collect actual posters but got no where to put them. Wow. That is very cool. You should post some pics of them one day on your blog. BTW, I updated my blogroll and put Vic’s Movie Den in the links. Great review mr DeLeon, im lookin forward to the next batch of bond! Thanks so much. I might do Never Say Never Again (even though its not an “official” Bond) or The Living Daylights. Glad you liked the review. Why the hell wouldn’t I like it? 🙂 Id like to see your take on never say never again..but why is that an unofficial one, i thought that was casino royale ( the sixties version) this wont be in the upcoming boxset then? Excellent review, I’m a massive fan of the Bond movies. Thanks! 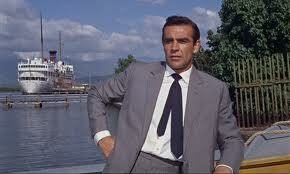 I am a huge fan of the Bond films, myself. Always have been. 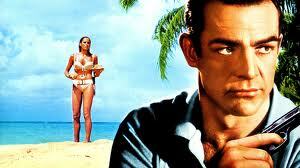 “Dr No” is a great debut. My fave is Connery entry is Goldfinger. I’m glad you liked the review, it was fun to do. Thanks for stopping by and leaving a comment!